Home > KMS	> kMS ver. 1.2.138 – My Experiences! kMS ver. 1.2.138 – My Experiences! I also found out some information about Demon Slayers while playing mine, and I’ve also outlined the Link Skills for those that are still a bit confused! There might also be a hint of a new area? Read past the cut to find out more! My Demon Slayer is also level 70 now! My Bowmaster has 10% extra damage on bosses~ Speaking of Demon Slayers, my storyline post is coming along! I have everything until the level 80 quest, and also the 4th job advancement! I just need information for a quest in the 100’s, and the level 140 quest as well. I don’t think I’ll be able to report what happens in the level 200 quest though, haha. While playing, I noticed that the DF bar actually changes depending on how much DF you have. If its 30 or less, the bar is yellow, 31~60 is blue, 61~90 is purple, and 91~120 is dark purple. Also, about DF, the base amount of DF you have never changes, it is always 10. However, your Force Shield, which you cannot unequip (except for the Ultimate Force Shield (thanks Danny! )), increases it by a certain amount. When you advance, the Force Shield is automatically upgraded to the next level. This causes your DF to increase permanently as well. The final Force Shield, the Ultimate Force Shield, also comes unidentified! Something special is that it will have specific stats when it is identified, 6 str, 24 accuracy, and 6 attack. 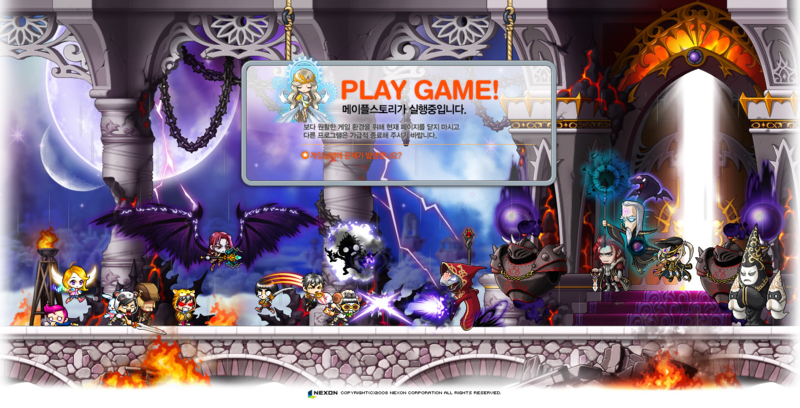 Something to note, currently when you press the Game Start button on the MapleStory website, this page appears. It features an area showed in the Demon Slayer storyline. However, there are some monsters there that aren’t in the data. Could this mean a new area of the Temple of Time is going to be released? I don’t know, but in September, there will be a boss update! Could this area be related to the boss update? Only time will tell. Oh and by the way, of you can’t unequip it, how are you gonna cube it? Just curious, cause I was not able to cube anything unless I unequip it. Can’t wait for the storyline! Congrats on getting the chairs you wanted! And that’s really cool for them to make the Ultimate Force Shield a 3 liner by default! Keep up the good work! Excellent! The auto potential on the Ultimate Force Shield is certainly a twist in the myth, and the color changing of the Force Gauge is really nice for those of us who don’t pay attention to their gauges already; a color sudden change in color is sure to catch eyes so we’re not trying to go and use something while the “You do not have enough Demon Force to use this skill” notice keeps coming, hahaha. The September update looks interesting already. I love the picture of the Temple of Time like area. It’s epic (and not in the loose usage of most anymore). Yeah, pretty sure we’re fighting the new general soon. 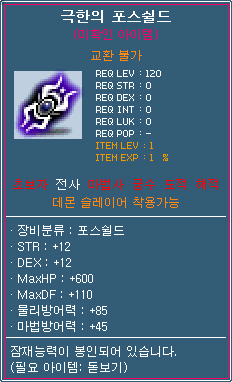 He is the owner of that ridiculous pendant that showed up in KMST data a while back, after all. I just wonder exactly why they’re thinking of releasing another major boss when barely anyone can defeat Cygnus already. Unless this new guy is fought in a different way. This one, that’s 5 attack/magic attack and 3 slots as well. Personally, I haven’t done them, but I know that they’re very good experience and I’ve heard that there’s an actual coherent storyline that connects them all. I agree that releasing another major boss would be odd since we have yet to steadily defeat Cygnus whatsoever and Cygnus is only a puppet, whilst a General would have to be many times more powerful than said puppet. However, and I an honest here, how would you go about fighting a boss more major than Cygnus in a “different way”? Maybe I’m narrow minded here, but I don’t see any other way than just beating him/her into the ground with force. I suppose you could be referring to a Party Quest of some sort, though that would contradict the whole “General > Cygnus” bit, unless of course the Party Quest was even more ridiculous. Not when said puppet happens to be the Empress of the Maple World, though. I’m guessing high level PQ/expedition now, something akin to CWKPQ or Guild Expedition. 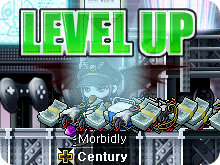 The highest level PQ currently has a minimum of Level 120, right? All things considered, it would only make sense that at least a couple of the Black Mage’s Generals would be more powerful than Cygnus, otherwise it would be outright stupid that Cygnus > everyone except the Black Mage himself. The “Boss Update” could very well be Cygnus being kicked down a few notches to make way for stronger bosses, and eventually Black Mage himself because, and let’s face it, we’re starting to run out of options because almost all Legends and Resistance are released, combined with the Generals now starting to have light shone upon them. We very well could be looking at a “Big Bang” for bosses exclusively. If you mean an actual PQ, then if I recall correctly, Dragon Rider only has a requirement of 105, though I may be mistaken…on any of that. Hm, yeah, it would make sense for bosses to recieve a revamp. Some have been complaining that bosses are either too easy or use tactics that are far too cheap nowadays. It’s mind-boggling how Maple doesn’t have instanced bosses yet as well. I briefly outlined the party quest revamp in an old post. I actually hope they kind of expand on the Future plot and Cygnus a bit. Honestly, we don’t really know much about Cygnus other than she was selected as the Empress, nor are we aware if she currently possesses any powers of her own. It would make sense for Cygnus to be more powerful than the Black Wing generals after being corrupted if she already had some sort power of her own, like kept secret or sealed or something. Would make for an interesting plot twist xP…but anyway, I’d rather not have any of the current bosses (especially Cygnus being my favorite one atm; evil cygnus knights ftw) be degraded. @Alilatias: I’m only a GMS player, so I’m not familiar with the new PQ for 120 from Jump! seeing as how we have yet to receive it. And I just smashed Zak on my (poorly funded and equipped) Hero with a friend (who was only level 127) because we were able to keep him “knocked-back” to prevent him from attacking, which is exactly why we finished with 11 minutes left. So I think that a buff and revamp for bosses in in order since my pitiful ZDuo should NOT have happened, I must admit. @??? : I kind of doubt that the Door to the Future plot will be expanded since it’s not an “actual event” since we all know that the Black Mage will be defeated before said time and that future will be null and void. I have to disagree with you, however, because if Cygnus was stronger than the Generals, then what purpose are the Generals? Why have them if a group of corrupt puppets are far more useful? Insight and tactics? I doubt that the Black Mage REALLY cares what they think. Unfortunately, Cygnus is going to receive an inevitable degrade because there will need to be room for a Black Mage boss, unless Nexon wants to expand the level cap (which I highly doubt would happen). Well, they have to continue the plot somehow. Maple isn’t just going to end at the Black Mage, unless Nexon somehow got tired of making money (lol…). Also who knows, there could be a new “Black Mage” in the future. Remember, this is the future. The generals have not made an appearance as of yet, nor is there actual news of the Black Mage other than the fact that he made Cygnus and her knights his puppets. Anything can happen, so as far as we know, the generals could be already dead by then. I don’t fully understand your logic as in the present, Cygnus is not evil yet, therefore it would still be useful to have the generals to manipulate. Yet generals are obviously disposable to the Black Mage as shown by the Demon Slayer’s plot, so if he finds a puppet(s) more powerful than they are, he’d probably not hesitate to replace them. he made Cygnus and her knights his puppets. Anything can happen, so as far as we know, the generals could be already dead by then. I don’t fully understand your logic as in the present, Cygnus is not evil yet, therefore it would still be useful to have the generals to manipulate. Yet generals are obviously disposable to the Black Mage as shown by the Demon Slayer’s plot, so if he finds a puppet(s) more powerful than they are, he’d probably not hesitate to replace them. But if the black mage got defeated then that future where Cygnus got evil wouldn’t exist. The only way that nexon released the Black Mage is if they make our present the future from ToT but then they would have to change everything that is related with Victoria Island and maybe you start in orbis as someone who flew from the cygnus guards and want to decide a job and make Cygnus Knights some knights that betrayed Cygnus. But they would have to a BigBang 2 and maybe raise the level cap, but the new max lvl would be just too difficult to archieve and making another exp curve would make lvling too easy to lvl 120. Ok, I understood the first part, then you kind of lost me there. Sorry, but I honestly don’t know what’s going on in the second part of that paragraph. To respond to the part that I do understand, like I said before, the future has many variables that affect it. For all we know, it could be a different Black Mage, or mabye they DON’T defeat the Black Mage by that time. I also don’t understand the significance of your quoting me. Once again, I apologize, but could you perhaps explain a bit more clearly? @??? and monblank: There can’t be a “new” Black Mage because it’s already outlined in the basic story about Cygnus meddling when she should have laid down and quit; it’s all told if you look on the main GMS website and (if you REALLY feel like digging into the earth) Spadow’s Blog. If there were a “new” Black Mage, it would have been thrown out that the original Black Mage was overthrone by a “new” one, or that there would be another in power. Hence, there can be no possible second Black Mage. I really don’t know how you can’t see this, no offense, but MapleStory’s plot is NOT going to end with the Black Mage taking over; that much is guaranteed since Maple’s popularity would plummet down past the deepest depth of Hades if it did. The plot WILL end someday and we’ll most likely have a new evil arise (Maybe the Red Mage? Oh, wait, I got it: the White Mage!). Also, the Black Mage didn’t demonstrate whatsoever that his Generals are disposable in the Demon Slayer’s plotline. Demon Slayer vowed revenge on the Black Mage; there is no purpose in keeping a General around when they vow to kill you. That’s no displaying how expendable they are, it’s showing that the Black Mage isn’t as stupid as a box of rocks. There’s a difference between puppets and Generals: the Black Mage controls puppets completely, while his influence controls 90% of the Generals’ actions. Sorry if my post seems jumbled, I’m trying to respond to both of you at once and I realized that I was responding to 2 people when I got to “stupid as a box of rocks”. First of all, you say it like expanding the plot that way would be impossible. Yet I can think of at least 50 unanswered questions that I am too lazy to post all at once about the future plot. Also what’s this about Maple ending with the Black Mage? I said it would probably only end with the Black Mage if Nexon somehow got tired of making money. Now obviously that’s not going to happen >_>. Secondly, if the Black Mage valued his generals so much, why would he intentionally let the Demon Slayer’s family be killed? Just like any other main villain, his underlings are nothing but disposable pawns to him. As far as I’m concerned, the generals are only useful to the Black Mage because they are powerful. If he were to find a more powerful pawn, I don’t see why he wouldn’t just replace them. No offense Karkain, not trying to troll or anything, but your post doesn’t disprove my original point, which is simply that the future plot CAN (but doesn’t have to, yet I hope it does) be expanded, and that the generals obviously mean nothing to the Black Mage other than being powerful pawns to be used for their power and then thrown away when they are no longer useful. A puppet on the other hand, would still be more useful than the generals if it was more powerful than them, as it would pose no risk of betrayal. @??? What I meant is that we can’t defeat the black mage in the present time, we would have to get to the future where cygnus became evil and destroyed everything to be possible to release the black mage defeatable, but it would just be too hard to do. IMO nexon should make the black mage defeatable just if they change the new antagonist of the story, just like blizard did in wow with the dragon in clataclysm. Also, I quoted you because I thougth it was the reply button and when I clicked reply where I had too the quote was still there and I had to erase it, but I didn’t completely erase it. @??? : Where you’re getting the “ending with Black Mage” shpeal is beyond me, because I have neither said, nor implied the notion. And next, I never said he valued his Generals either, as they are only hands (that are obviously stronger than all others) to carry out tasks. Why Demon Slayer’s family was killed is something that I’m willing to bet will be revealed in the future since we don’t know why currently. I get that, and I respect your thoughts; however, the plot would be a waste of time to expand because (as I have stated prior to this) the Black Mage will be defeated and we will most likely receive a new antagonist, or perhaps regress to the state of “bad guy limbo” that MapleStory was in until Pirates were introduced. Either way, the Black Mage will end, as with everything that revolved around him. My point is that enough to adequately explain the Dark Ereve plot is already present and there is no need, nor do I think there ever will be a need, to expand it (mostly considering it is an area exclusive to players level 160+). In the end, the events of Dark Ereve will be null and void due to the fact that those events will never come to pass because Dark Ereve’s setting is 10 years ahead of right now. Well it was an interesting discussion while it lasted, but I’m not saying it’s necessary to expand the future Ereve plot, but it would be something that I’d prefer they do. Not saying they will either, but in all fairness, I have enough evidence of holes in the story to show that it’s still possible. @??? : Uhm, half your entire post is nil, sorry; a mishap in communication on my part. 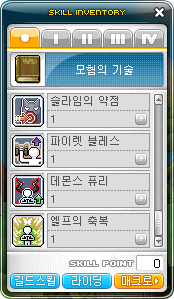 I suppose so, however MapleStory is an MMORPG, not an award-winning novel; there are GOING to be unknowns in the story. Surprisingly, they are! I think I’m gonna continue mine past 70, haha. Answered the quests question in reply to Alilatias, but monsters didn’t change o_o I mean there was a couple of map changes and a couple of new monsters added, but that’s it. Can we cube out Ultimate Force Shield? I’m not sure, since you can’t unequip it or anything (like a previous poster pointed out). Whoops. My bad. I’ll go check again. I wonder if the new boss is the Black Mage. Gratz on your accomplishments Max. Anyway, those new monsters look interesting…what is that robed snake/lizard/whatever? Applications open up every three months, and then you have a chance to get in. The ultimate force shield can be unequiped. 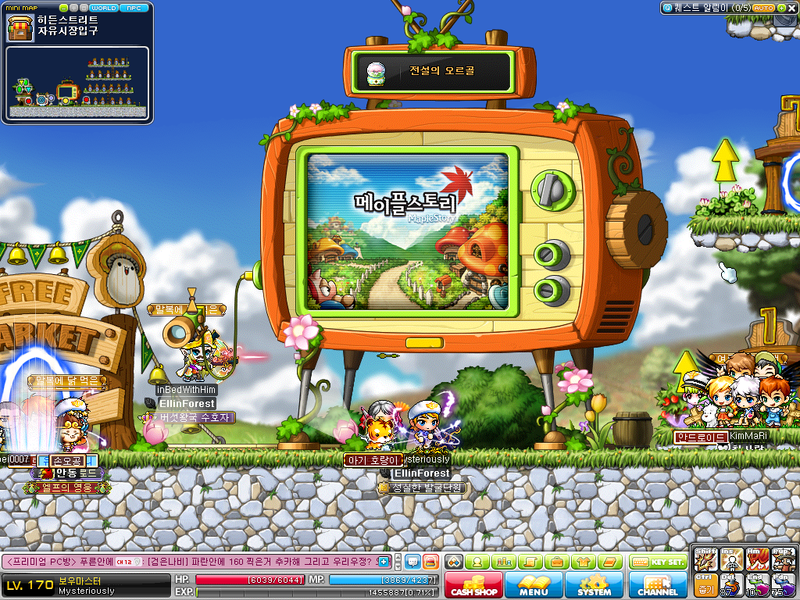 Nexon changed magnifying glasses also to be able to be hovered over your character window. So yeah, you can cube it. Cabana Boy, and I believe my face is the Evan face? I’m not sure if this has been asked before, but can you delete the characters and keep the link? I haven’t tried myself (don’t wanna risk losing them!) but I’m gonna assume the Link Skill will be deleted. If I’m not wrong, the skill link should be deleted together with your character deletion. So this means that the highest DF that a Demon Slayer could have is 10+110? i dont know if someone’s already asked….but do u get to keep ur old shields when u get new ones? Nope, they get automatically upgraded. I’m not sure why anyone would cube over 6 ATK on a shield though, unless they were pretty confident that they’d get something like 9%+ STR. Wait… that shield can be dropped??? and what happen if happens??? considering you can’t unequip it, I doubt it can be dropped. I’ve been wondering about this for awhile, but what do those link skills do? How do you transfer a link skill to another character :O? Get to level 70 and you can press the Link button to choose the character you want to link it to. As long as the new patch does not leveling a character I am happy. I am so tired from leveling and none of my Legend characters are above 100. 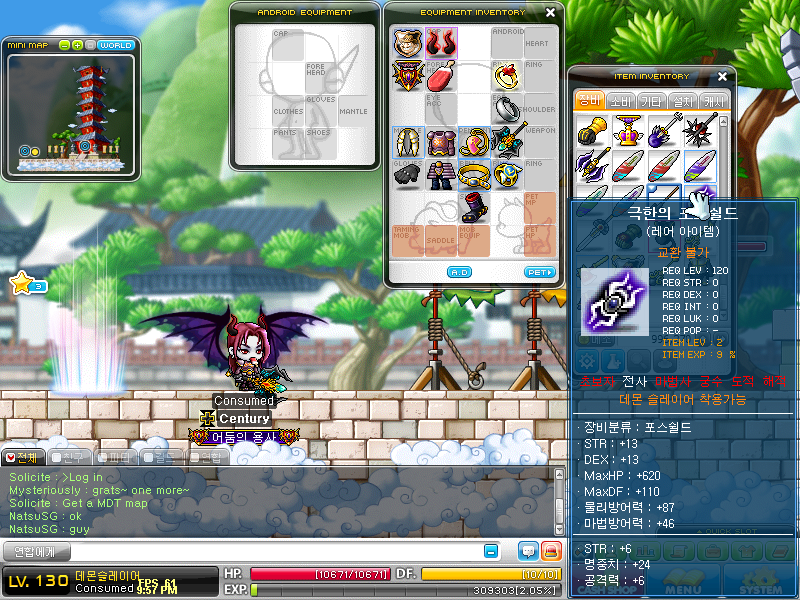 Nexon wants to kill me. Yo max, thanks for answering my question earlier. Actually almost every single event for the past while has given armor/accessory scrolls for attack. Hey max does the empress blessing skills get removed and replaced by Link skills? Nope, but I just like the Blessing system better (given to all characters). So can you change which character you have linked your skill to? Yes you can, once per day. Cygnus isn’t actually more powerful than the generals. It’s usually Shinsoo or Benedict protecting her. Empress Cygnus fell into a trap because she took away the power of the World Tree (An unknown power source). Once she took the power away from the tree she and her knights became powerful so the Black Mage made Cygnus and her knights evil. You forget to note that it never actually says that the empress got her hands on the power from the World Tree. She and her knights found the tree alright, but they fell into the Black Mage’s trap when they got there. That also doesn’t explain why the evil Cygnus is more powerful than the evil Shinsoo. On another note, the Black Mage can’t just turn them evil whenever he wants to; it’s not like “oh, she’s powerful now because she got the power of the world tree, time to corrupt her!” The empress and her knights fell into a trap, so in other words, they were somehow caught off guard, allowing the Black Mage to corrupt them then and there. Ok I think you are going too far with the storyline of maple. Nexon just told us that story so we would know a reason why she became evil. It’s not like this is a game based on a real story or something. It still makes you wonder. Who is Cygnus exactly? 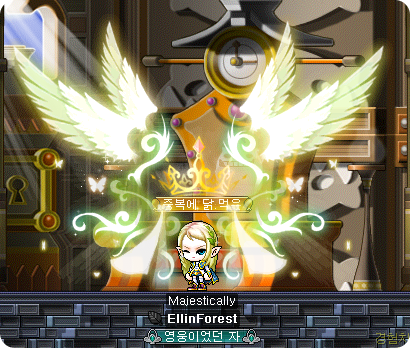 Some random girl who happened to be chosen as the Empress of the entire maple world? Whether they expand on the storyline this way or not, this question still should be answered one way or another. They should release the 5 heroes before they release the black mage. Dammit forgot to put my e-mail and name for tht comment^^^^^^…Now it’s anonymous sigh……….Anyways ummm Max u know that picture u posted up on ur blog….The one with the play game and a background of Demon Slayer’s tutorial who’s tht figure in the picture beside the words PLAY GAME! You know the statues all around the ToT? Hey Max, do you have any info on how the new mp gain formula works? Does anybody know if you can change Mercedes hair and eye with NX to make it less like a girl? You can change the hair and eyes if you want. 1. What’s the order of popularity for the legend classes? 3. Do Demon Slayers use axes or bws more? 4. Can a regular archer equip a dual bow gun? 5. Which did you have to most fun training? Currently, I see mostly Demon Slayers, then Mercedes, then Cannon Shooters. That is a good idea, I’ll try later today and tell you what I found out haha. Personally, I liked Demon Slayer the most! I tried it and archers CAN equip them! You can’t shoot anything but you can at least pretend to be a Mercedes! In kMS, dual bowguns were sold in the Shop of Legend before Mercedes came out as well, so you can trick your friends into thinking you are the new job too, haha. Is Mercedes weapon consider 2hand or 1hand? Also do they have any party skill? Two handed, and other than MW, no. one the empress probably is that powerful on her own thanks to the power of the world tree and she was probably almost as powerful as a hero (at least more power than an adventurer) before that so she would be much stronger. And if his generals were stronger, then why would he need her as a puppet. why not just kill her with his general. you said hes probably not the type to listen to other’s insight, so he probably isn’t the type to just let someone weaker than he already has that he would have no use for other than a purpose which requires that strength, is. Plus, you need generals in wars not because they are better than lower ranks at their jobs, but because your army is too big to handle alone.